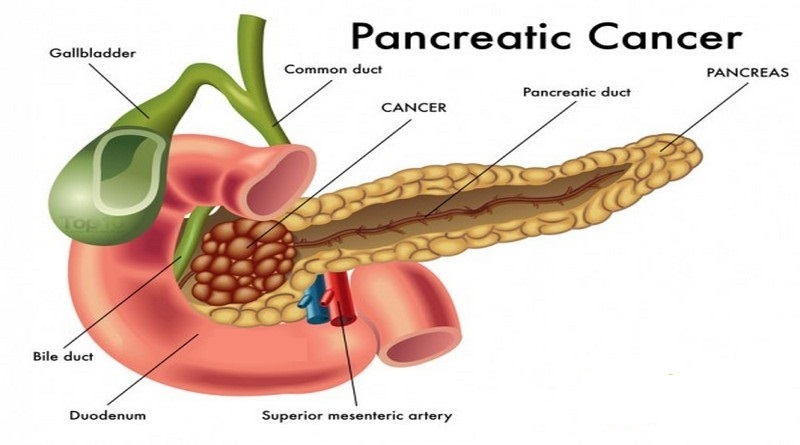 Pancreatic cancer is a cancer that starts in the pancreas, which is a gland that produces digestive juices and insulin, as well as other hormones to do with digestion. The part which produces the digestive juices is called the exocrine pancreas and the part which produces hormones, including insuline, is called the endocrine pancreas. Cancers that develop from these two parts can behave different and cause different symptoms. Around 9,600 people in the UK get pancreatic cancer each year. It is more common in older people with almost half of all new cases diagnosed in people aged 75 and over. Pancreatic cancer can start in the head, body or tail of the pancreas. There are different types of cells in the pancreas. Most pancreatic cancers are the exocrine type. More than 8 out of 10 exocrine pancreatic cancers are adenocarcinomas. Rarer types of exocrine pancreatic cancr includes cystic tymours and cancer of the aciniar cells. Endocrine tumours are uncommon and are also called pancreatic neuroendocrine tumours (PNETS) or islet cells tumours. Other rare types of cancer of the pancreas are pancreatoblastoma, sarcomas of the pancreas and lymphoma. Treatment of exocrine tumours depends on whether the tumour can be removed (resected) with surgery. The cancer may be resectable (can be removed), borderine resectable (less clear if it can be removed) or unresectable (locally advanced or has spread to other organs). For resectable tumours, which means the tumour is involving the pancreas and surrounding strutures such as the small bowel, bile duct or stomach, but is not affecting any of the nearby blood vessels. The main treatment for this is surgery and then patients may have chemotherapy after. Borderline resectable means that the cancer is in the pancreas and involes the nearby blood vessels. If this is the case it may make it more difficult for the surgeon to remove the cancer completely and cancer cells too small to see may be left behind. Research shows that if the surgeon is unable to remove an area around the cancer with no cancer cells (clear margin) the risk of cancer coming back is high and the benefits of having a large operation are less clear. The patient then might have chemotherapy to reduce the size of the tumour first and then the operation, only if surgeon thinks it is possible to remove it completely and remove a clear margin of tissue from around the tumour. This is usually as part of a clinical trial. Chemotherapy will be used usually for 6 months if surgery is not possible. Unresectable tumours may be locally advanced or have spread elsewhere (called advanced or metastatic). Locally advanced cancer is whern the cancer has not spread elsewhere in the body but it is blocking or completely surrounding the nearby major blood vessels. It is not possible to remove these cancers completely with surgery. Chemotherapy is the main treatment but surgery can help control or prevent symptoms. For advanced or metastatic tumours, if the patient is fit and well then chemotherapy can be used. Other treatments like stents can be used to help reduce symptoms. treatment for endocrine pancreatic tumours are much rarer and require different treatment. This will be discussed in next section. Generaly for adults with pancreatic cancer in England and Wales, around 20% will survive their cancer for 1 year or more, almost 5% will survive their cancer for 5 years or more and only 1% will survive their cancer for 10 years or more after diagnosis. The poor outlook for pancreatic cancer is that it is often diagnosed too late and by time someone has the symptoms, goes to their doctor and is diagnosed, the cancer is very often quite advanced. What are neuroendocrine tumours (NETs)? 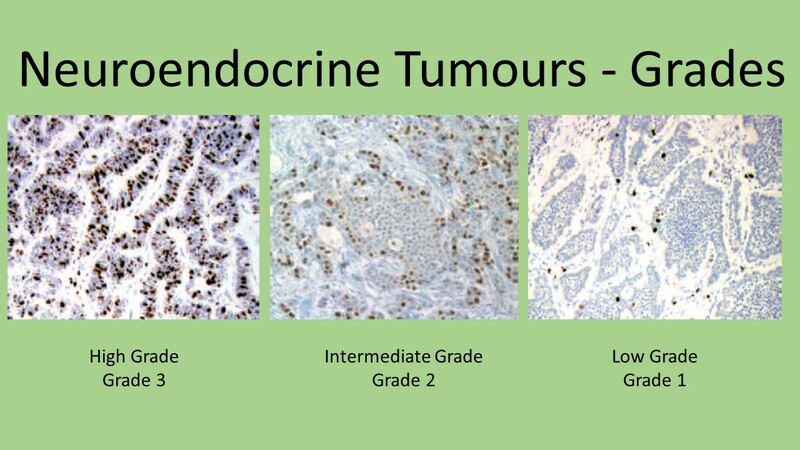 Neuroendocrine tumours are rare tumours that develop in cells of the neuroendocrine system. This includes the pancreas. These are called pancreatic neuroendocrine tumours (pNETs). These tumours include insulinomas, gastrinomas, glucagonomas, VIPomas and somatostantinoma. The main treatments for insulinomas, gastrinomas and somatostatinoma is surgery. For glucaganomas and VIPoma it is initially treatment to control symptoms and then once they are under control the main treatment is again surgery. Neuroendocrine tumours generally have a better outlook than exocrine pancreatic tumours. The following statistics are from an American study looking at patients diagnosed between 1985 and 2004. Generally, 55% of patients who have surgery for an early stage tumour survive for 5 years or more and around 15% of people who are unable to have surgery survive for 5 years or more. The University of Cambridge Pancreatic Cancer Centre brings researchers in basic and clinical science together with surgeons, physicians and nurses who treat pancreatic cancer at Addenbrooke's Hospital, in a multi-disciplinary approach to translational research to improve patient outcomes.